The Aurora Borealis Lodge offers two types of lodging. 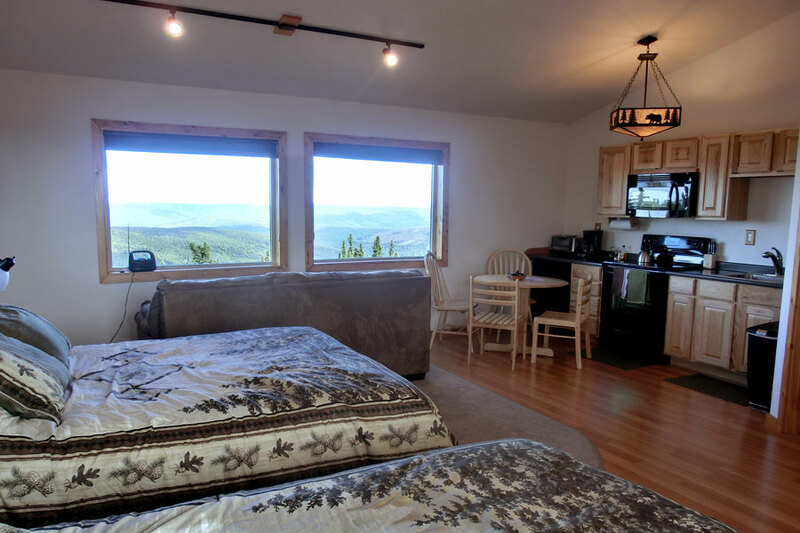 The Cedar Lodge offers four private rooms with north facing windows with excellent views of the night sky. Logan’s Chalet is a spacious two bedroom Alaskan log home with an aurora viewing platform in the front yard. Overnight lodging is open August 16 to April 15. Please scroll down or click here for our AVAILABILITY CALENDAR. The Cedar Lodge has two rooms on the first floor and two rooms on the second floor for a total of four rooms. Each room is approximately 400 sq. ft, and is set up like an efficiency condo with a kitchen and private bathroom. The kitchen features full size oven/cook top, apartment size refrigerator (with freezer compartment), microwave, coffee maker, toaster oven, rice cooker, pots/pans, utensils, cooking tools. Also supplied are coffee, tea, sugar/creamer packs, cooking oil and soy sauce. The bathroom features hand held showerheads, heated bidet toilet seats, soap/shampoo, towels, toilet paper, and hair dryer. 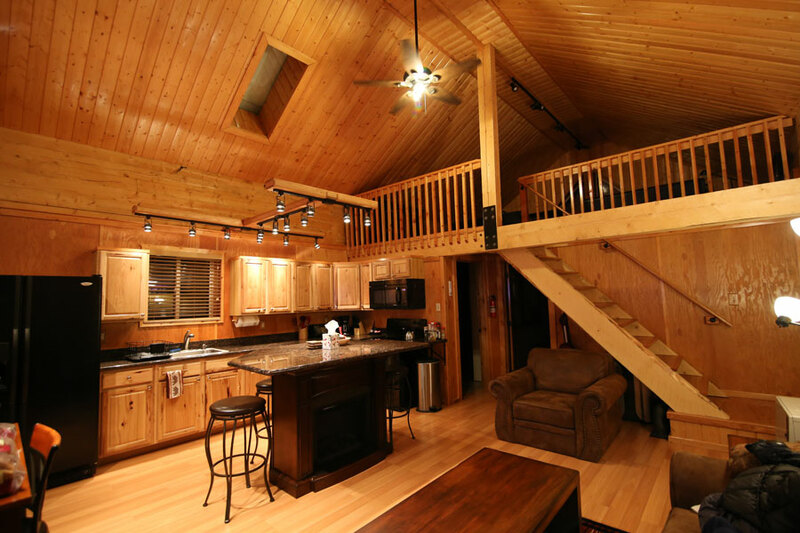 Logan’s Chalet is a 2 bedroom/1 bathroom, 1000 square ft log house. It’s perfect for families, groups of friends, or even two-person parties who like to have more privacy. Two Bedrooms – A spacious loft bedroom with 2 queen beds, and a first floor bedroom with 1 queen bed. One Bathroom – Heated toilet seat/bidet, and shower (no tub). Leather sofa & chair in the living area. Flatscreen TV with DishNet satellite. Walkie-Talkie / Text access to Aurora Alerts. Exclusive 15 foot high Aurora Viewing Platform. The kitchen features full size oven/cook top, full size refrigerator, microwave, coffee maker, toaster oven, rice cooker, pots/pans, utensils, cooking tools. Also supplied are coffee, tea, sugar/creamer packs, cooking oil and soy sauce. Rates for Cedar Lodge Guest Rooms, based on double occupancy. 1, 2, 3 & 4 or more nights rate available. Multiple night rates are for consecutive night stays. Check in – 4 p.m. / Check Out – 11 a.m. Please add 8% FNSB Bed Tax to above rates. Children ages 6 to 15 are $1/year age/night. Children 5 & under stay free with paying adults. Visa, MasterCard, Discover, JCB & American Express accepted. $25.00 non-refundable deposit per night per room. Full payment due 14-days prior to arrival date (an invoice for the remaining balance will be e-mailed to you). Cancellations made within 8-14 days of arrival date will be charged 50% of the total (less bed tax). The remainder will be refunded. Cancellations made within 7 days of arrival date will be charged full amount. If we are able to resell the room, you will be refunded accordingly less the original $25/night non-refundable deposit. Rates for up to 4 people. $35/night non-refundable deposit required to confirm reservations. Full payment due 30-days prior to arrival date (an invoice for the remaining balance will be e-mailed to you). Cancellations made 11-30 days prior to arrival date will be refunded 50% of total. Cancellation made within 10 days will be charged the full amount of stay. If we are able to resell the room, you will be refunded accordingly less the original $35/night non-refundable deposit. Please fill out the below request form and include first and last name for your group's primary contact. We will get back to you to confirm most updated availability. If you do not hear back from us within 3 days, please e-mail directly to info@auroracabin.com. Rooms 1 & 2 are second floor rooms. Rooms 3 & 4 are first floor rooms. View from south porch on Cedar Lodge 2nd FL.